The Donegal Town Community Band will proudly display a brand new uniform at the upcoming St. Patrick’s Day Parade in the town in a few weeks time. And it’s all thanks to a massively sucessful Fundraiser in the Abbey Hotel on Saturday night when eight couples went toe to toe for a Strictly Come Dancing Final of Finalists Dance off. A surprise guest judge was internationally renowned professional dancer & choreographer; Mike Spalding who is involved in the opening and closing ceremonies of this year’s London Olympics. He flew in from London earlier in the day to join Josephine Tinneny whose family have been steeped in a 40 year dancing tradition. Local dancer; Bertie Love was the popular third judge. Interval entertainment was supplied by singer / songwriter; Emily Wheelan and the singing group, the Retrotones. 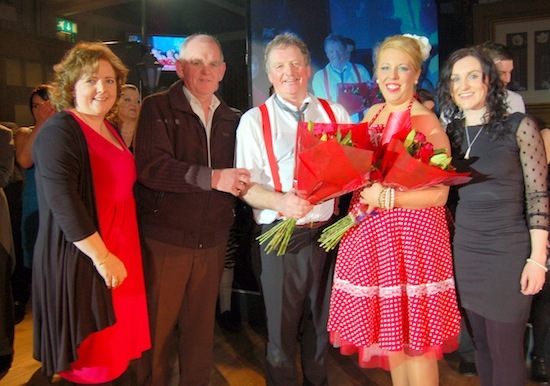 Guest dancers were Pauric Kennedy and Orla O Donnell. The eight couples were put through their moves by professional dancer; Shona Tinneny who went over and beyond the call of duty to raise the standard of dancing in this type of competition to a new level. Dual MC’s; TV3’s Noel Cunningham and local MC Paul O Sullivan added variety to the compering role. On behalf of the dancers, Aidy Gallagher said they were treated royally by the organisers all through the preparation. Eddie McCaffrey and Martina O Donnell were the overall winners who donated their €1,000 winning to the Suicide Aware and support group S.T.O.P. They were sponsored by the Solis Lough Eske Castle Hotel.